near death sparks a primal fear response of run, hide, escape, the person is not running to spiritualism, they are trying to avoid it, if their programming has taught them that a spiritual life is on the other side of death. It's been said, many want to go to heaven but nobody wants to die....i wonder why? Most believers who want to meet their maker should not fear death, but embrace it, shouldn't they? Not intended to make any one feel sorry for me, but a response from my own experience. I have a terminal incurable disease, my mental and physical feeling of well being fluctuates madly and there are times when I would certainly be happy to die. However, the inbuilt instinctive survival mode kicks in, the body's own will to survive seems to be stronger than my personal wish that I be allowed to die, (comfortably). In my case it is a physical thing, nothing to do with faith or wishing to meet my maker. I guess that applies to others as well, the body itself says, run, hide, do what is needed to survive, and fact shuts down systems in order to let others carry on, I have had this explained to me medically and experienced it myself. Sometimes I am struggling so hard to breathe, I almost lose control of my bowels and bladder. Nothing to do with fear, just the body redirecting energies for survival. I would say the ultimate wish to survive in most has little to do with faith, and a lot to do with the body fighting for life in its own, involuntary way. Don't confuse "science" with "scientists". There are individual scientists who believe in some sort of supernatural god, but that's beside the point, really. The point still stands: Why should we believe in something that is not supported by a shred of evidence? What is the value in accepting something when we have no reason whatsoever to believe that it is true, other than the fact that we really, really want it to be true? Seers and prophets and gurus and preachers say all sorts of things, some of which are inherently contradictory and some of which are extraordinary indeed. Why should we believe any of it? What is it that makes us, as a species, so willing to accept things without the slightest hint of any sort of proof that they might have any truth at all? History certainly shows us that whenever some religious faith disagrees with science on some matter of empirical fact, the religion is wrong and the science is right. Why, since faith can't get provable things right, should anyone believe that it gets unprovable things right? Re-read what I said. I didn't say the author of The Tao of Physics was a layperson; I said the book attempts to merge Hindu religion with a layperson's understanding of physics. Fritjof Capra isn't a layperson; he's a fraud. The target audience for his book is laypeople. To quote physicist Dr. Heinz R. Pagels, author of The Cosmic Code: Quantum Physics as the Language of Nature: "No qualified physicist that I know would claim to find such a connection [between Hindu mysticism and physics] without knowingly committing fraud. The claim that the fields of modern physics have anything to do with the "field of consciousness" is false. The notion that what physicists call "the vacuum state" has anything to do with consciousness is nonsense. The claim that large numbers of people meditating helps reduce crime and war by creating a unified field of consciousness is foolishness of a high order. The presentation of the ideas of modern physics side by side, and apparently supportive of, the ideas of the Maharishi about pure consciousness can only be intended to deceive those who might not know any better." Sadly, possibly not for much longer. 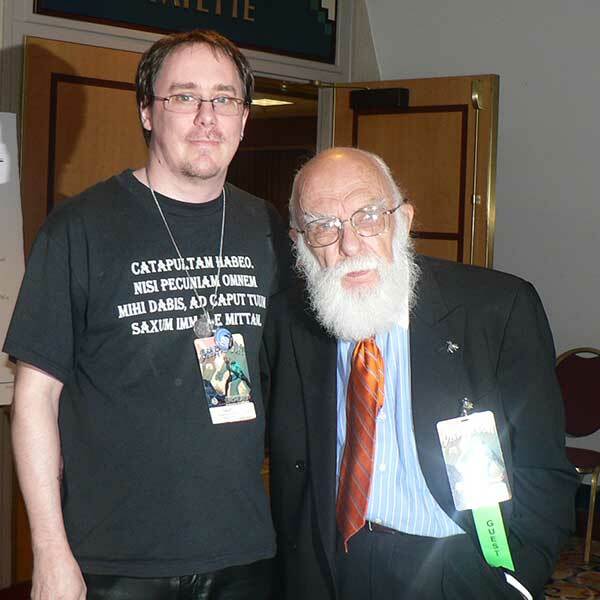 James Randi, who is a personal hero of mine (I met him in person for the first time last year), is currently in poor health. He is, I think, one of the few people who has made a big difference acting as a voice of reason and sanity in a world awash with irrationality, and I feel privileged to have met him. I believe that if more people thought the way he did, we'd have fewer people willing to blow themselves up or fly airplanes into buildings in hopes of eternal life in some sort of magical hereafter. Just so. An internal feeling is not actually proof. Muslims have spiritual feelings of Allah; Christians have spiritual feelings of Jesus; Hindus have spiritual feelings of Vishnu; yet not all these things can be true, for they are each mutually contradictory. The presence of an internal feeling, even an overwhelming one, does not necessarily imply an external supernatural force. near death sparks a primal fear response of run, hide, escape, the person is not running to spiritualism, they are trying to avoid it, if their programming has taught them that a spiritual life is on the other side of death. Say one rainy night John Doe is driving a little too fast. While negotiating one particular hilly curve, he overestimates the coefficient of friction and the vehicle skids off the road and starts tumbling down the hillside. After 20 seconds (which feels more like several minutes) the car eventually stops rolling about. The shattered windshield is caved in, with tree branches looming just inches from his face... yet he manages to crawl out of the car (trembling) and (shakily) stands up. Dumbfounded, he realizes he's lucky to still be alive. It's been said, many want to go to heaven but nobody wants to die....i wonder why? Most believers who want to meet their maker should not fear death, but embrace it, shouldn't they? Ops, I'm thinking logically. Good questions. Problem is (and has been all along): i never claimed to know any of those answers (or cared one way or the other in "providing" them, if i did). You like science right? Then present a more convincing case of your allegation (fraud). If you're a big fan of Randi, then don't settle for these murky references. What exactly did Capra say?... what did you understand it to mean?... and what proof can you show us that it's "fraudulent"? BTW, apparently Pagels sold books too [e.g., "The Cosmic Code" ]. And -- in true karmic nature -- someone found a way to dissect it and discover 'a load of erroneous presuppositions'. And on, and on, and yawn. Perhaps Pagels was blending the Maharishi's words with Capra's in order to hype his own product... who knows? I gotta side with dkmarsh here: i really *don't* have a dog in this race. I mentioned Capra because i enjoyed reading his thoughts 30 years ago. If you want to tear him up, go for it. [but i haven't seen anything conclusive or scientific as yet.] So far you've said Paul Davies "doesn't know what science is", and Fritjof Capra "is a fraud". [and you were none too kind to Einstein either.] I would pay some serious money to be in the same room, if you guys ever got together. I read a fine quote sometime back about strong beliefs. I don't remember the exact quote nor the author but it goes something like this: "There is no correlation between how strongly one believes that a hypothesis is true and whether or not it is actually true." BTW, the author was a scientist and was referring not to religious faith but to scientists who have strong convictions about their unproved hypotheses. BTW, the author was a scientist and was referring not to religious faith but to scientists who have strong convictions about their unproved hypotheses. Disclaimer: I find 10-dimensional string theory to be aesthetically pleasing from a mathematical perspective, but the experimental confirmation is nada at this point, because of the energy requirements. This is, at least in part, the reason for the Large Hadron Collider . I certainly wouldn't want to be heard claiming that there exist aspects of experience which only can be understood outside of science, when extended objects that are charged sources for differential form generalizations of the vector potential electromagnetic field offer such a compelling argument to the contrary. String theory my BIG TOE. Finally, we turn to the relationship between the 10-dimensional world described above, (with 9 spatial and 1 time dimension) and the real 4-dimensional world (3 spatial and 1 time dimension) that we inhabit. The key requirement is that the 9 spatial dimensions that we start with should not all be physically observable. In the spirit of Kaluza and Klein, we therefore assume that 6 spatial dimensions are "curled up" on themselves, while the remaining 3 dimensions extend to infinity (or at least to very large distances). The concept of "space" is embodied in mathematics by the notion of a "manifold", something that locally looks like familiar space but may have curvature and other nontrivial properties. In particular, a manifold that is "curled up" in the way that we desire is called "compact". Thus, the most straightforward way to connect string theory to the real world is to postulate that 6 spatial dimensions form a compact manifold, whose size is so small that we are unable to detect its existence directly with the probes available to us. Expressed that way, i can begin to see how the 10 dimensional model is more comfortable (sincerely, no sarcasm intended there). Interesting that time is always one-dimensional. Or perhaps that was God's plan? OOOOPS... i meant Nature's Way. Bronowski’s principle of tolerance locates the roots of science in the domain of human creativity, in the necessity for personal judgment in science, and in the provisional and progressive nature of scientific truth: “You have to tell the truth the way you see it. And yet you have to be tolerant of the fact that neither you nor the man you are arguing with is going to get it right”. For example, even if LHC experiments confirm some x-dimensional string theory to be 100% accurate beyond reproach -- that still only proves that it's a good representation of reality... not "reality" itself. Thus -- much like the several schools currently interpreting quantum mechanical phenomena -- there will (most probably) evolve a variety of viewpoints "defining" what that x-dimensional string model means [i.e., seems to indicate about reality]. It seems to me that that, in a nutshell, is the core of this entire discussion and the most fundamental difference between you and I.
I believe that there exists beyond ourselves a physical world, and that this physical world exists independently of us. I believe that insofar as some model, idea, postulate hypothesis, or model conforms in its properties to the real world, it is true, and insofar as it does not, it is false. I believe that the more we understand about the physical world, the better our understanding of ourselves. And--perhaps most key--I do not believe there is any advantage to holding onto an idea simply because we find it pleasing or comforting. I do not believe that the comforting lie is superior to the comfortable truth. In fact, I believe that holding on to comforting ideas that are false, just because they are comforting, is an incredibly harmful, destructive impulse that throughout history has been responsible, and continues to be responsible, for the vast majority of human atrocity. 1. That is not a good tool for understanding the physical world. All the prophets, rabbis, fakirs, priests, seers, shamans, mystics, mediums, spiritualists, sages, medicine men, witch doctors, gurus, and occultists who have ever lived, with all their visions, prophesies, revelations, and divine inspiration combined, have shed less light on the workings of the physical world than Isaac Newton alone. Without the essential ingredient of "going out and seeing if your ideas actually work," no dream, vision, or revelation can be counted on to explain the workings of the world. 2. "What you want" and "what pleases you" most often means what supports your prevailing prejudices, insecurities, and fears." This is why we see, over and over, some kind of faith used as the foundation of morality, yet we also see that the moral values given to us by preachers and prophets are evil, twisted, corrupted versions of the very prejudices held by those preachers and prophets. From the Christian Bible, which endorses slavery and teaches that women are inferior to men, to the rural parts of India where religious faith teaches that it is acceptable to burn a woman alive if she is suspected of infidelity, we see over and over again that taking things on faith is the easy way to justifying atrocity, and that the beliefs which are most pleasing are those which most legitimize the evil impulses of the believer. For those who care passionately about the truth, "believe what you want, whatever pleases you" is moral and intellectual bankruptcy. Physical world... that's it? So, human consciousness is nothing but swirling particles of matter? Over eons, they became intelligent and self-aware [somehow] and found themselves posting at the Fine Tuned Mac forums chatting about quantum electrodynamics and string theory? Them's some miraculous particles. How do suppose they do that? I would make the case that physicists have bumped up against the ultimate barrier of the physical world. The reason their thoughts are rational but not visualizable is because they remain rational scientists, but they believe, without proof, in the metaphysical reality of a material world without a spiritual substrate. They have shut themselves off from, a priori, the very substrate of the material world, the spiritual world. And--perhaps most key--I do not believe there is any advantage to holding onto an idea simply because we find it pleasing or comforting. I do not believe that the comforting lie is superior to the comfortable truth. But realistically that isn't even the choice, is it? Not as far as i'm concerned anyway. Again, i don't know to what specifically you might be referring... but, if you're suggesting that i'm "holding on" to some "comforting lie" despite being aware of an alternative [corresponding] "comfortable truth"... i'd say that in all probability you are mistaken. 1. That is not a good tool for understanding the physical world. Did i ever say it was? No... thus: no argument. edit: BTW, is repealing the First Amendment high up there on your To-Do list then? It seems to me that that, in a nutshell, is the core of this entire discussion and the most fundamental difference between you and I.. Okay. Well then -- aside from "posting" me into oblivion and repealing the First Ammedment -- how do you presume to overcome this (perceived) predicament? Whether consciously or not, you appear to be tippy-toeing right into "believe what i tell you to believe" territory... much like the zealots you purport to despise (ironically enough). At this juncture i would like to point out that -- back on page *4* -- i tried to redirect the angular momentum of this thread into a slightly more elevated orbit. I linked to that 'Interpretations of Quantum Mechanics' page and tried to solicit views on the various schools of thought listed there. In essence, you declined that invitation (and my 2nd appeal as well), with not so much as a relevant response... let alone any direct reply to my specific "Copenhagen" query. Indeed it can be said you have been totally 'tacit' in that respect. Somehow, the focus always strays back into one of these anti-religion sermons and/or questionnaires; going to the extent of researching the names of every god in the wiki (or did you recall all those from memory?) Your point has been well made for over (at least) 6 of the past 8 pages, repetitiously so. Parts i agree with and parts don't seem to pertain to me. In those places where we both disagree (and it does apply to me), i don't wish to dwell... but, i have placed some responses earlier in this post. I have absolutely no interest in "converting" anyone (do you?). Or is the purpose of this anti-religion smokescreen to *avoid* actually engaging in discussion wherein ideas about various (as yet) unexplained scientific principles could be shared? Remember... "unexplained scientific principles"...the original title of this thread? From the Christian Bible, which endorses slavery and teaches that women are inferior to men..
That's no on the first, and, uh, no on the second. But those misconceptions are common. The references to slavery and women's submissiveness in the new testament are both from the Pauline epistles. In each case, Paul is writing to a particular church in a particular culture which bore little or no resemblance to any modern culture. As an aside both of these appear in epistles (letters) that are generally thought to have actually been written by the Apostle Paul while modern computer supported scholarship has placed the true authorship of many of the so called Pauline epistles in doubt, but that is a whole other topic. Christians in some communities were freeing their slaves, but those freedmen and women were forbidden to earn money, to own property, or even to beg for food or shelter. So freeing a slave was tantamount to a sentence of slow death by starvation and exposure to the elements. Paul is urging the masters and their slaves to maintain the relationship as a more caring option in that particular cultural situation. Because Christians were freeing slaves, some jurisdictions passed laws forbidding freeing slaves because of the problems created by the starving former slaves. Paul's recommendations for spousal relations are in a similar vein. At that time in that part of the world the status of women was little, if any, better than that of slaves. Women's business transactions had to be performed by their husband, father or brother except in very rare circumstances. Likewise women could own no property and if they angered their husband all the husband had to do was say, "I divorce you, I divorce you, I divorce you" and the divorce was final. When that happened the woman had essentially two options. If her family permitted, return home in shame, which caused the family to lose face and status in the community. The other alternative was prostitution and the life expectancy of a prostitute was less than six months. Paul is calling on the women to do what they had to do to survive and more importantly he is urging the husbands to treat their wives, and polygamy was common, with respect and not casually or in a pique cast them aside. Any effort to understand either the Hebrew (old) or the Greek (new) testament without a consideration of the culture in which they were written, the audience to which they were addressed, the viewpoint of the authors, the preconceptions of the translators, and the translators convictions is doomed to misinterpretation and misunderstanding. I will also add that the letter of Paul's writings such as these can easily lead to the wrong conclusion, but the underlying principle these exemplify are as valid today as they were on the day they were written. As joemikeb eloquently explains, that link describing the social conditions of an ancient time is not the equivalent to the statement I quoted from Tacit's post. Christians in some communities were freeing their slaves, but those freedmen and women were forbidden to earn money, to own property, or even to beg for food or shelter. So freeing a slave was tantamount to a sentence of slow death by starvation and exposure to the elements. I will also add that the letter of Paul's writings such as these can easily lead to the wrong conclusion, but the underlying principle these exemplify are as valid today as they were on the day they were written. Joemikeb, your explanation is kinda silly. Your defending Paul and telling the world that Christians not only had slaves but also were condemning them to death with their own laws and rituals that didn't allow women to survive on their own. I must have missed the part where God stepped in and stopped this tragedy. Is there any written statements on gender equality in the bible, in practice or in the Abrahamic tradition for that matter? I produced the written evidence in the bible that confirm what Gregg had discounted. Tacit's comment was accurate. I don't think I need to read Greek or Hebrew to understand the epistles. If I need clarification I'll have to resort to my many years of parochial education and scrape by on rusty Latin. You've misunderstood that post in a few places, and/or you're mixing in some ideas that are not a response to the post. It's hard to tell. I guess the "part you missed" was the New Law. And you weren't being invited to learn Greek or Hebrew. There's more to your link than I realized. The first time, I didn't scroll down, and just read the introductory paragraph. There are some things, on a quick read, that the author just has wrong. I suspect that lack of understanding is in play on many of the others, but some appear to present a formidable challenge on first reading. Gregg, I could with certainty easily find more evidence to make my point. We could start with the story in the Garden of Eden. Just look on-line and see for yourself how many gender equality organizations there are for the rights of Christian women, and then by contrast find somewhere men are seeking equality and justice. One of Joe's points was that one would need to understand the culture of the time. He makes a valid point, but I do understand the era, and I have a background in Christian theology and still I arrive at the same conclusion. Slavery of women in the US in the past 500 years was a product of Christian in America. It was Christian Europeans that brought most of the slaves here. It was Christian men who raped and exploited the slaves. It was Christians that inflicted genocide on 12 million Native Americans. And I've not even touched upon the genocide of central and South American or Eastern Europe. Coming from a Christian background and many years of parochial schools, I know the history and the contradictions very well, and from my perspective one of the most destructive forces that ever plagued this planet, was and is, the Abrahamic religions. Through the eons Jews, Christian and Muslims have been butchering indigenous people around the globe using justifications of Gods will or Manifest Destiny to steal land, resources, labor, power, or money while trying to convince the world that they hold the moral high ground, the hypocrisy is enough the gag a maggot, and even today defenders turn a blind eye to history so they can feel secure in their destiny in the clouds. If the US and Western Nations want to succeed in the 21st century they will have to shed this addiction and move on to reason and accountability. Mark, I appreciate the tone of the above post. I respectfully submit that it concentrates on the actions of people, and reflects poorly on the religion those people followed (or followed to some degree). It does not prove that the religion is morally bankrupt, just that the individuals are. During the same periods of time, there were other adherents of the same religions who acted nobly. I am quite sure that there are documented cases of the evil actions of people who claim (or claimed) no religious faith. That does not mean that all people with no religious faith are evil. Similarly, think about political scandals. We certainly have many to ponder. Don't you suppose that within the administrations tainted by scandal (and try to name one in the U.S. that wasn't!) there were people who did not violate any legal or ethical standard in the performance of their duties? Of course there were! Some even resigned rather than compromise their integrity. But, which stories do we hear more about? I read a article excerpted from The Greatest Show on Earth: The Evidence for Evolution in the Oct. 5 edition of Newsweek the other day. I found it very thought-provoking, in spite of author Richard Dawkins' obvious arrogance and condescending attitude towards those taking an opposite position. I would love to witness a debate between Dawkins and Francis Collins (geneticist and newly appointed head of the National Institutes of Health) who believes that evolution can be compatible with faith in God. I know that such a debate would not settle anything, but it would certainly be entertaining! Gregg, excuse my exuberance please, it wasn't meant to offend. The point I'm attempting to make is that if there is some divine guidance in following the prime mover that history clearly demonstrates that one could not perceive the difference between a person that is guided and a person that is not. Certainly you'll find non-believers committing the same atrocities, but they're not claiming that it is for a divine purpose. They don't lure in the innocent, dependent, and seeker of support with promises of life after death, honey & virgins to do their bidding, nor do they claim moral authority. They're not using physiological manipulation through sensory overload to convince someone that this is truth. They don't require the person to face to the east many times per day and capture thought energy through repetitive injury. This is the product of a theory without evidence. The idea has been fruitful in that it has been able to accumulate great wealth and power through manipulation throughout the eons, but I would argue that it has been a destructive force in our development as a species. The idea…has pitted men against men, villages against villages, nations against nations and east against west. There and millions in the US that would kill a Commie at first sight, not because they might be from Russia, but because they don't have a god. The funny part is that the Believer doesn't have a god either; they have an idea and an organization to support the notion without evidence. If a corporation employs people who do not represent the mission statement, they have an obligation to discipline or remove them; Manifest Destiny was never addressed because it served the organization. One could argue that because the organization is so large and diverse that it wouldn't be possible to oversee everyone, but I would recount by arguing that this is supposed to be divine providence and no human discipline should be needed. Certainly one would have to agree that discipline has been used against followers that did not follow closely. A visit to Salem Mass would certainly set the record straight. If one looks at the world today, and sees the conflicts around the world they would notice a similar thread running though most of them. Genocide by Muslims in Africa in the name of Allah to capture oil and riches. The power is in the organized religion, not in the national identity. The Israelis relocating to the Promise land, displacing a hundred thousand Palestinians in their wake and justifying their actions under the command of their god, this is not Nation building it's Kingdom building. A logical man would conclude that a voice from the clouds is ridicules and have no reason to commit atrocities to fulfill the voices wishes, but those who are susceptible to supernatural influence or for those who use this theory for their own gain, the only idea that is ridicules is the one they do not accept. This is not a path to a fact or a truth, it is a method of population manipulation using accumulated followers and their wealth to confuse the facts for their own benefit. It is one thing to have an active hypothesis and to work on it until it finds facts, and quite another to act on a hypothesis and make up the rules as you go along. After thousands of years and billions of people contemplating for trillions of hours on the same notion and not being able to produce one shred of evidence, one might think that the theory has run its course. With all due respect. Mark, no offense taken. But I wonder if you misread my first sentence. It is clear that you and I cannot think alike on this matter. There wouldn’t be much use in itemizing all the points in your post above that I differ with you on or take issue with. Whatever I write is not going to change your mind, and I don’t see an indication that you’re even interested in trying to understand the opposing point of view. You didn’t acknowledge the primary point I made in my previous post, and instead you continued in the same vein. Generated in 1.827 seconds in which 1.426 seconds were spent on a total of 15 queries. Zlib compression enabled.